It has been that sort of tour-de-force season for Federer, the 35-year-old Swiss maestro who might not yet have regained the No. 1 ranking but is firmly atop the sport on every surface except clay. 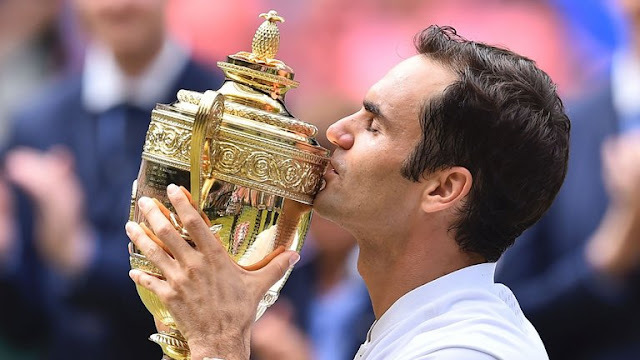 Roger Federer, who turns 36 next month, is the oldest man to win the Wimbledon singles title in the Open era On Sunday, he won his eighth Wimbledon singles championship and 19th Grand Slam singles title by defeating Marin Cilic in straight sets, 6-3, 6-1, 6-4. The victory, his first at Wimbledon since 2012, made Federer the oldest man to win at the All England Club in the Open era, which began in 1968. It also broke Federer’s historical tie with William Renshaw and Pete Sampras, who each won Wimbledon seven times. Federer gave his first big hint that he was on his way to big things here by upsetting Sampras in the fourth round in five sets in 2001. He won his first Wimbledon singles title in 2003, sporting a scraggly beard and a ponytail. Fourteen years later, Federer, now the father of four young children, was clean-cut and clean-shaven as he defeated Cilic to win his eighth.